It seemed inevitable, and now it has happened: after a string of disastrous results, Chelsea have definitively parted ways with Jose Mourinho and named former Netherlands manager Guus Hiddink as interim manager until the end of the season. Hiddink has worked as a caretaker manager for Chelsea before. 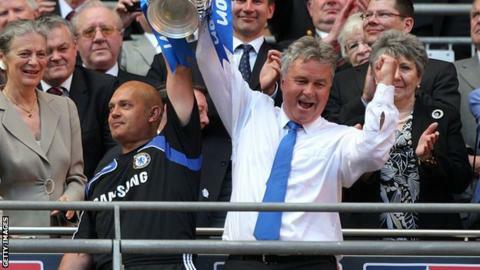 Taking temporary charge after the dismissal of Luiz Felipe Scolari in 2009, he managed to turn things around and ended the season winning the FA Cup and reaching the semi-final of the Champions League. Chelsea owner Roman Abramovich, who is a personal friend of Hiddink, will remember that past success. But since that last spell, six years have passed. What has Hiddink been up to in the meantime, and is the Dutchman still the same manager as before? Did Jose hoodwink the media? Why did it go wrong for Mourinho? He has managed Turkey, Russian side Anzhi Makhachkala and the Dutch national team. All three jobs were relatively unsuccessful, with his spell as manager of the Netherlands perhaps being one of the most disappointing stages of his career. Hiddink took charge of the Dutch national team in 2014, succeeding Louis van Gaal, who had just joined Manchester United. He was tasked with the difficult job of forging a new team out of a group of relatively inexperienced players. From the beginning, he seemed like a fish out of water. He had been successful as manager of the Netherlands before, leading the Dutch to the semi-final of the World Cup in 1998, but simply seemed incapable of imposing his ideas on this new generation of Dutch footballers. After winning only four of his 10 matches in charge, Hiddink was dismissed in June 2015. The Dutchman's second spell as manager of the Dutch national team had not even lasted one year. In the Netherlands, there is still a debate going on about the exact role Hiddink played in the Dutch demise. Should he have done better during the time he was given, or were matters out of his control? In any case, Danny Blind, who succeeded Hiddink, failed to turn things around. In the end, the Dutch did not even qualify for Euro 2016. What's the view on Hiddink in Holland? Hiddink took charge of the the Netherlands during a difficult time. The Dutch had just reached third place at the World Cup in Brazil, thanks in no small part to the iron discipline Louis van Gaal had managed to instil in the squad. Doubts were there from the get-go. At the respectable age of 68, did the veteran still have enough of a connection with modern football? What's more, after having been away from the Netherlands for so long, was he the one to restore the so-called "Dutch school" of football? Critics were even more worried about the juxtaposition between Van Gaal and Hiddink's styles of management. Where the former comes across as somewhat of an authoritarian, Hiddink is much more of a "people's manager" and a "great communicator". Instead of vying for control over everything that happens on the pitch, Hiddink likes to put faith in his best players by giving them the freedom to express themselves. Ultimately, the critics were proven right. Not for one moment did Hiddink's Netherlands side play as well as they did under Van Gaal in Brazil. Then again, the crisis the Dutch are facing at the moment might be much bigger than Hiddink. With "Total Football" seemingly a thing of the past, was it fair to expect Hiddink to invent something new in less than a year? In the Netherlands, Hiddink's admirers also like to point to his trophy cabinet and past successes. From club success with teams like PSV and Real Madrid to great achievements on the international stage with South Korea and Australia, the list seems almost endless. All things considered, Hiddink might have been the right man at the wrong time. His recent failure as manager of the national team has put a dent in his reputation in the Netherlands, but thanks to his past successes a certain eminence still surrounds his aura. Can Hiddink turn things around for Chelsea? All things considered, Hiddink seems like a very specific type of manager. While building a new team from the ground up might not be his cup of tea any more, he may well be one of the best caretaker managers available. He knows how to put a hand on a player's shoulder at exactly the right moment. He knows how and when to compliment his best players. He knows how to make a team relax, and he knows how to restore trust in a dressing room consumed by stress and fear. In this regard, Hiddink might be an ideal fit for Chelsea at this moment in time. With top managers like Pep Guardiola and Diego Simeone likely unavailable until next summer, Abramovich could have done much worse than appointing his Dutch friend as a mender and crisis solver. It remains to be seen whether his failure as Netherlands boss last year has had a great effect on Hiddink. It may well be that the veteran boss has come out a little bit jaded and not quite as confident as he used to be. Then again, there is also a chance Hiddink is relishing the opportunity to prove to the world that he still has it in him. Steadying Chelsea's ship would certainly be the perfect way to finish his career on a high note. Read more on Did Jose Mourinho pull one final trick on the media?